Day of Giving Friday: You Are The Best! So I took an unconventional approach to this die and split it in half horizontally, scored and folded it. I’m a little bit on a dimension kick so I wanted to create a valance above and below that brings your eye to the center. To decorate those, I used the detail piece in the set to add a flourish to the flaps I created from the Regal Allure die. For my sentiment I cut the banner from Spellbinders Decorative Swallowtail Tags and smudged it with Ranger Brushed Corduroy Distress Ink before taking the paper out of the die – by default that gives the banner a nice border. Then I finished up by stamping a sentiment from Quietfire Design – it’s part of a double sentiment but I simply used You are the Best! For new readers, every Friday it’s my pleasure to give away a card. The card goes to a randomly picked reader (worldwide) who leaves a comment in our conversation. Want to know more about Day of Giving, here’s a link to my FAQ’s just check out #11. You can check the list of winners HERE! For your comment: What do you consider to be your greatest weakness? Love you all! I’ll see you soon!! Beaitutiful post Becca. The personal message you share this week is timely. I appreciate your humbleness, encouragement, and sincerity. Sometimes your messages are a “hug”. Gracias. Hi Becca, Wow you take your emotions & you created this beautiful card. I also use my crafting as my personal healing from lifes roller coaster ride. lol though my emotions do not produce masterpieces like yours! Thank you for sharing your amazing talent. My biggest weakness is probably my generosity. People can sometimes use it & take it for granted. Cyndy that’s your nature we are who we are ! to anyone including our self…. Wow, Becca! What an awesome testimony that God is helping you through something you thought couldn’t be fixed. Such an encouragement. I am afraid my weakness is food. Hi Elaine God bless your honesty lol !!! Most of us if we are honest would fit that category …. This is a very lovely card, Becca!! I love your cards and I love your new dies. Oh My! This card is so lovely and very Springy :D I love it so much. My greatest weakness – hmmm – impatience and I can become irritated too quickly. Simply stunning. I’m lucky enough to own this die Becca. And I couldn’t and wouldn’t part with it. Becca, This is an beautiful card. You always amaze me with your ideas. Your post today is a shining example of why I so appreciate who you are and how you nurture this community. 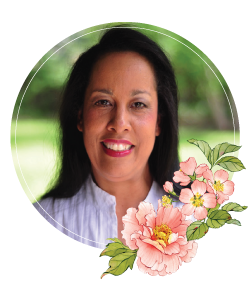 Card making is a kind of meditation in my life and it creates a space for peace and insight. When I read your words and the comments from others, it does invite me to sit with the questions and listen to what comes up. There is such a sense of like mindedness, that sometimes I read my very thoughts coming from another’s words. Do you hear our cheers and feel our hugs of support in your newfound hope? Such a lovely card. That pale pink detail piece really caught my eye. That, and the lovely piece of lace peeking out from under the sentiment! I love all the delicate touches – from the two valances, to the lace flower, to the pink flower, and the multiple loops on the ribbon! Hello Becca very feminine card lovely ! for myself ! Lots of people would be able to relate to that . Your card is absolutely lovely! There is an exquisite feel to it that is so elegant. I am seriously considering adding this die to my collection. What a stunning card Becca! Your creativity never ceases to amaze me. I consider my greatest weakness to be collecting craft supplies! I tend to buy much more then I have time to use, thereby taking up more room than I have. I am doing something about it though. I have undertaken the job of “clearing out” and letting go. It’s hard, but I’m getting there. It will always be a constant struggle, because I love creating. My weakness is procrastination! I have never been very tidy of a homemaker, and so things tend to get cluttered! It takes a big step to get me cleaning! It doesn’t help that my sweet husband is a huge clutter bug! What a beautiful card! Thank you for teaching me to really look at my dies. I would have never thought to cut it into and turn it into this beautiful card. Gorgeous details! Love this beautiful card! I love this card! The layers are perfect together. And of course the colors are just so pretty. 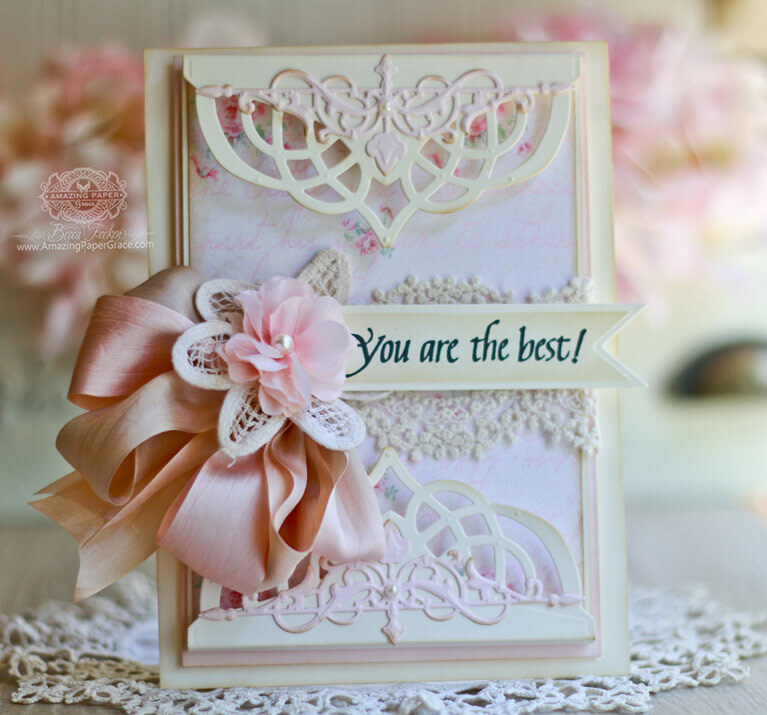 Such a beautiful card today, sweet sentiment, a gorgeous die cut and some lovely lace, what more could you ask for! I’ve found the die here in the UK too. You´ve just done it again here Becca, and made the most gorgeous card. 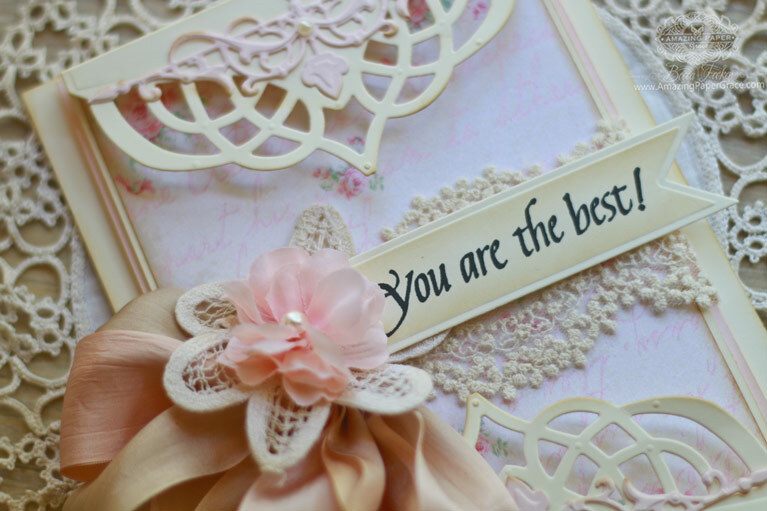 It is sooo beautiful and would definitely light up anybodys day to recieve a card like this, that´s for sure. What a shame this die is being discontinued. Today’s card is so very beautiful and shows the die off to perfection. My greatest weakness is the inability to say “NO”. My daughter has told me many times that the smallest word is a word I am unable to say!!! Beautiful card today for Day of Giving. Was the last one given really in February? Or am I missing something. How I would absolutly love to win your totally stunning card, Becca ! You are genius in your field! When I am being asked, which cardstile I admire the most, my answer is Becca Feeken ! :-)) I wish, that we were anke to get all those wonderful dies in Denmark. We have alot, but there is also many we have to order from USA if we REALLY want them. They get very expensive them because of taxes. 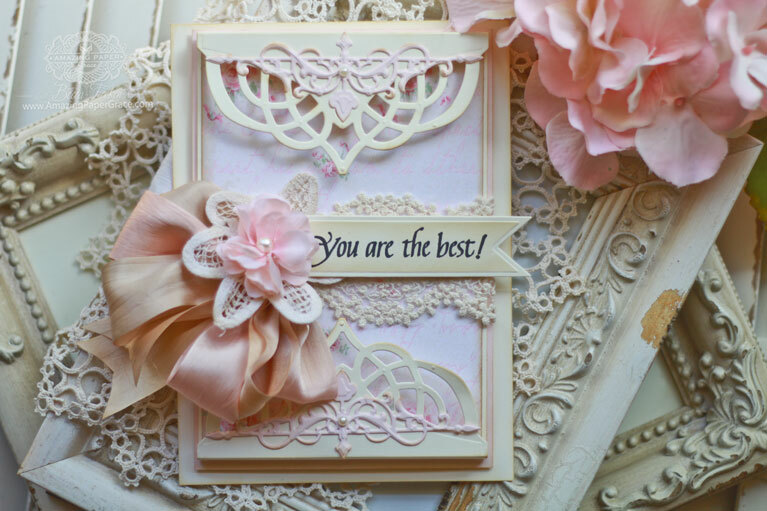 Hi Becca, This is a stunningly elegant card, shabby chic and beautiful. My weakness is that I am too sensitive and too emotional, I sometimes wish that I could keep my emotions in check, I cry far too easily and get emotional far too quickly, if I feel something it shows in my face. I love the way you have cut and made 2 sections to frame your card! It certainly does draw the eye into the centre! Your question made me think of Dorcas Lane in ‘Lark Rise to Candleford’. The first episode I watched had Dorcas saying – ‘Cake is my one weakness!’, but the more episodes I watched, the more I heard Dorcas saying that other things were her ‘one weakness’. I’m much like Dorcas in that I might want to believe that ‘cake is my one weakness’, but in truth, I have many! It is a wonderful series and at the end, she tells Gabriel that she has many weaknesses and we love her all the more for her confession! Second guessing people and wondering if they are truly being genuine is a big problem for me.